The new results build on a long and systematic search for distant galaxies that the team has carried out with the VLT over the last foure years. "Archaeologists can reconstruct a timeline of the past from the artifacts they find in different layers of soil. 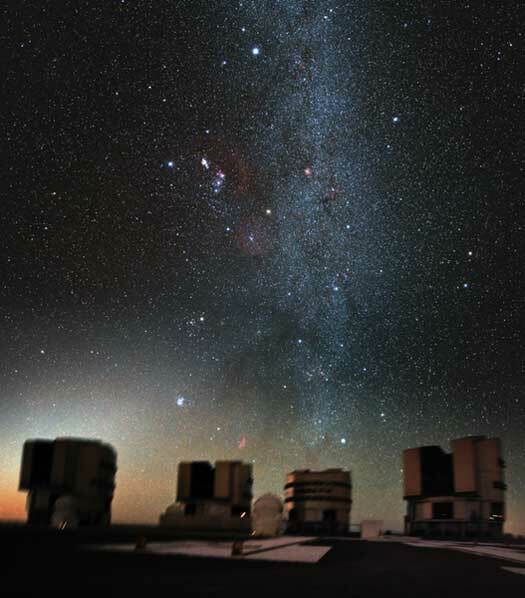 Astronomers can go one better: we can look directly into the remote past and observe the faint light from different galaxies at different stages in cosmic evolution," explained Adriano Fontana, of INAF Rome Astronomical Observatory who led this project. "The differences between the galaxies tell us about the changing conditions in the Universe over this important period, and how quickly these changes were occurring." "We see a dramatic difference in the amount of ultraviolet light that was blocked between the earliest and latest galaxies in our sample," said Laura Pentericci of INAF Rome Astronomical Observatory. "When the Universe was only 780 million years old this neutral hydrogen was quite abundant, filling from 10 to 50% of the Universe' volume. But only 200 million years later the amount of neutral hydrogen had dropped to a very low level, similar to what we see today. It seems that reionisation must have happened quicker than astronomers previously thought." powerful telescopes. For this study, the team used the great light-gathering power of the 8.2-metre VLT to carry out spectroscopic observations, targetting galaxies first identified by the NASA/ESA Hubble Space Telescope and in deep images from the VLT.